Nacatl War-Pride must be blocked by exactly one creature if able. 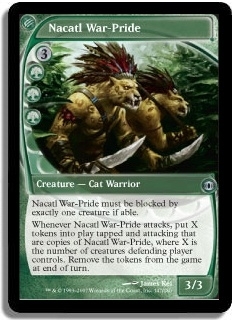 Whenever Nacatl War-Pride attacks, put X tokens into play tapped and attacking that are copies of Nacatl War-Pride, where X is the number of creatures defending player controls. Remove the tokens from the game at end of turn.